The City of Savannah, concerned about what might go wrong if the proper chemicals were not used, decided that the Park and Tree Commission should carry out the greening each year using a food quality dye considered safe for humans and the fountain. The first official Greening of the Fountain ceremony took place soon after and the St. Patrick’s Day Parade Committee was invited to participate, blending this historic and ornate work of art with the Irish festive season. 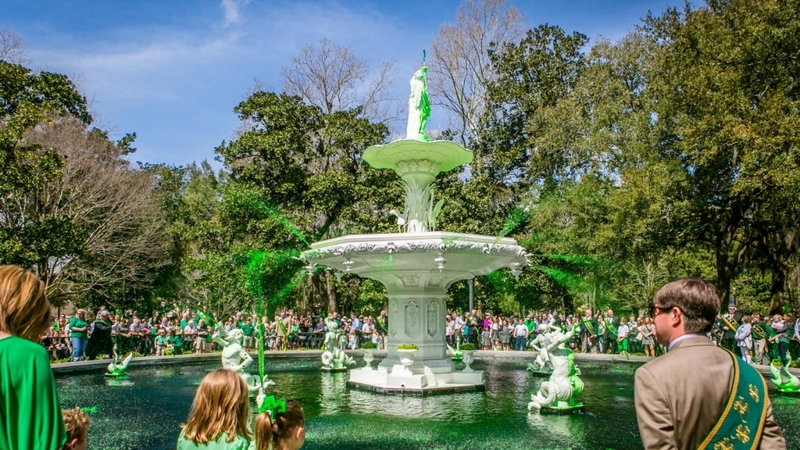 The are now nine fountains throughout the Historic District that flow green for the annual celebration, but it is the Greening of the Forsyth Park Fountain which has become one of the many officially recognized celebrations organized by the St. Patrick’s Day Parade Committee leading up to the Parade. This year's greening will take place on Friday, March 8th, at noon.